Thrill your guests with an ornate and beautifully hand crafted religious symbol that every Christian worshipper will cherish. Are you looking for a special and unique favor for a religious event? These magnificent trinket boxes are relevant and beautifully crafted. Our box is made from poly resin in the shape of a cross. It offers a detailed and ornate design on the top and sides, hand painted in an antique ivory finish. The matte gold filigree pattern will delight the eye and the single clear rhinestone in the middle adds a perfect finishing touch. The top of the box lifts off to store jewelry or small change or a special memento. 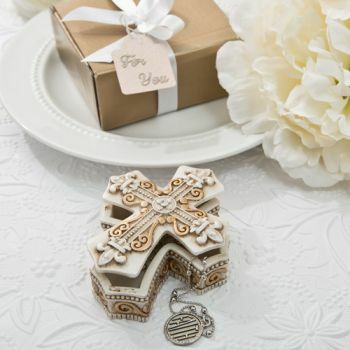 This stunning box is the perfect favor to offer at christenings, communions and other Christian events. Size is 3 1/4" x 2 3/4"